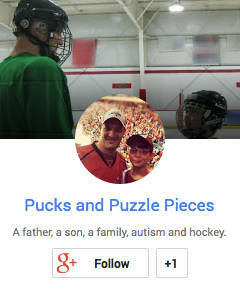 The story of Sam Tageson and the San Jose Sharks has nothing to do with autism. But it deserves a retelling. This will not be a post about autism. Like many of you, I read the new CDC autism prevalence report. I watched the Autism Speaks press conference from Washington that followed. I stewed over the borderline irresponsible reporting on this morning’s television news. And … I need some time to process how I feel about it. So today’s post will not be about autism. Instead, it will be about some of our other favorite topics in this space, namely, the San Jose Sharks and the sport of hockey. It’s also about the embrace of those with challenges and differences, and something else, too: welcoming someone inside the circle. 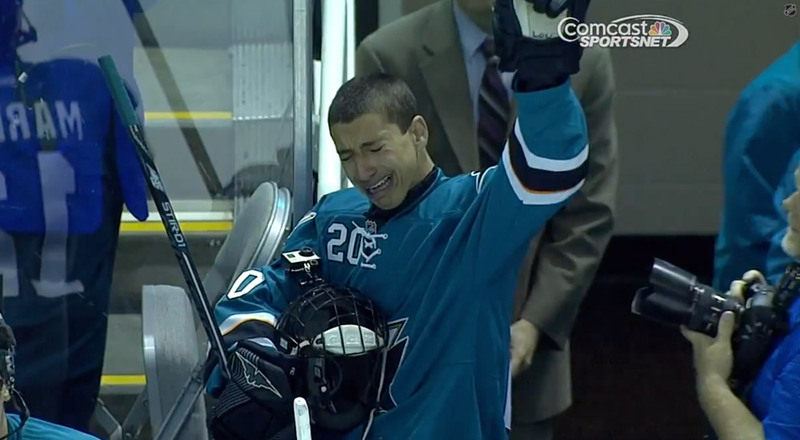 Not long after Ryan met the Sharks players, and just after the team featured his story on the homepage of its Web site, San Jose made national news for an extraordinary gesture to a young fan named Sam Tageson. The Make-A-Wish Foundation and the team worked to grant Sam, 18, who was born with hypoplastic left heart syndrome and may require a heart transplant, a “day with the Sharks.” He was signed to a one-day contract, met with reporters, met all the players, and even took the ice with the team at practice. Make-A-Wish has arranged for similar visits for many young people and many teams. And if the story ended there, it would still be a wonderful one. A young man facing some stiff challenges is left with an incredible memory. The team is left with the knowledge it provided a bright spot during a difficult time. Its fans can feel just a little better about rooting for their favorite club. But that’s not where this story ends, not by a long shot. And that’s why it deserves retelling. I’ve spent the last 15 years working around professional hockey. I’ve learned a few things in that time. Among them: Game day is sacred, and usually off-limits. NHL players and teams are very civic-minded. It’s not uncommon for players to spend a lone off-day in a 10-day stretch engaged in some charitable or community endeavor. But game day? Game day is a business day, and teams go to great lengths to minimize any and all distractions. They stick to routine. Players have their morning skate, meetings, team meals, pregame naps, and show up at the rink for the game at the appointed hour. Rarely does anything deviate from the plan. The first thing that makes Sam Tageson’s day with the Sharks out of the ordinary is that it occurred on a game day. The team brought him into the locker room for its morning practice. Sam took part in that practice. Afterwards he hung out with the team and dined with various team officials, learning about different parts of the business. But the best was yet to come. At game time, with the arena packed with 17,000 screaming fans, the Sharks prepared for their pregame ritual. Ever since San Jose joined the NHL in 1991, the Sharks have had one of the most unique entrances in all of sports. The players take the ice through a giant shark head that descends from the arena roof, spewing smoke from dry ice machines. In the team’s entire history, no non-player had ever taken the ice through the shark head. 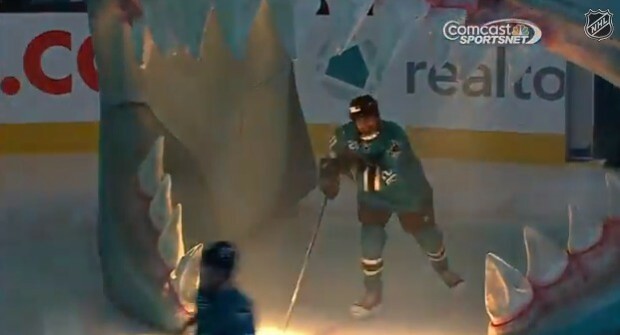 Tageson takes the ice through the shark head — on game day. With the crowd noise building to a fever pitch, there was Sam, sprinting on to the ice with the rest of the players. If you’ve ever played sports, or even just watched the movie Rudy, you’re probably getting chills thinking about what that moment must have meant for Sam. He wasn’t just visiting the team. For one night, they made him a PART of the team. Afterwards, Sam was announced to the crowd and received a standing ovation. He began waving from the bench before becoming overwhelmed with emotion in what was a very powerful moment. I get choked up just thinking about the impact that moment had for a young man who has had so many obstacles placed in his path. During the game broadcast, a feature on Sam’s day aired. It showed various parts of his day, and of course that look on his face when he was acknowledged by the crowd. But it showed something else, too, something that told me not only did the team welcome him for the day, they treated him like he belonged. We know from recent headlines this doesn’t always stop at playful jokes. But it remains an important part of team bonding. 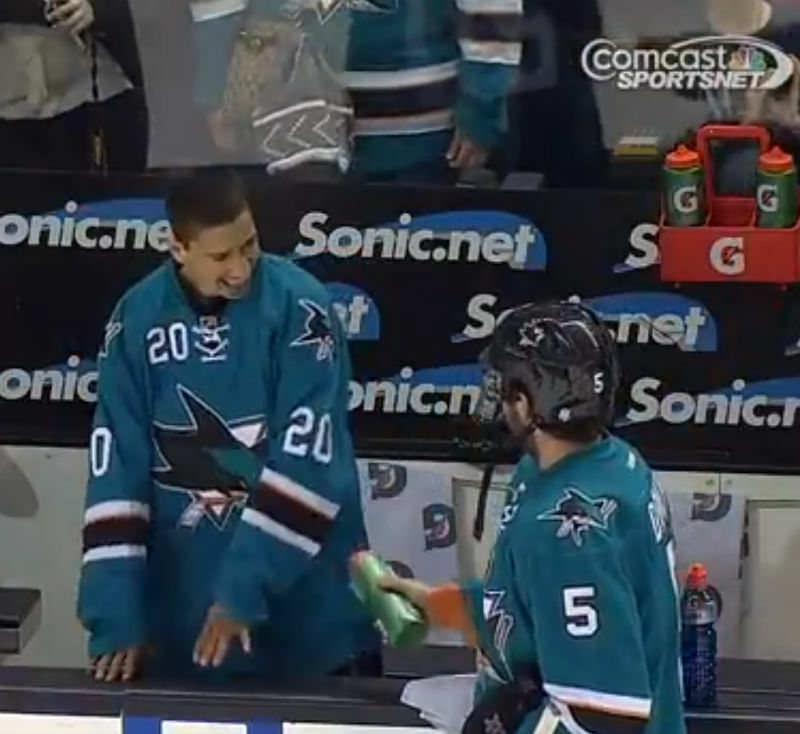 To see Demers squirting Sam at the bench meant that he was treating this guest like a member of the team. Sam can be seen laughing — he knows he’s been accepted. Hockey players can be very territorial. The sport is full of rituals and unwritten rules, all designed to show respect to those that have earned their members ship. Most team locker rooms have a gigantic team logo on the center of the floor, and nobody is allowed to walk on it — especially not outsiders like the media. During high-profile events like the Stanley Cup Final, teams sometimes put up barriers to protect the logo from being trampled by the swelled crowd of reporters. It may seem like a ridiculous exercise, but it’s all about paying proper homage to those that have made it to this exclusive club. The Stanley Cup is another example. Player and coaches who have never won it refuse to touch it, since they haven’t earned the privilege. Some will even leave the room if the Cup is present. This may seem extreme, but again, it’s about paying proper respect to the one thing for which they all strive. What I’m getting at is that hockey players aren’t naturally inclined to welcome an outsider behind the walls. Certainly not on game day. And yet, the Sharks did just that, and then went the extra step of making their guest a part of the team and taking an already memorable day to the next level. In interviews afterwards, Sam said it was “the greatest moment of his life,” and I had to smile. Ryan said the same thing about meeting his Sharks heroes a few weeks earlier. We are still seeing the impact of that day. It seems to have created in Ryan a sense of confidence that is greater than what we’ve seen before. It gave him something to brag about, which has been rare in his childhood. In short, it left an impact that will not soon diminish. I’m sure the same can be said for Sam Tageson. Seeing his special moment unfold was amazing, and touching, and inspiring. Seeing how the team embraced him? Even better. This is amazing and that video is the sweetest thing I’ve ever seen. I was a hockey sister my entire life and still love the sport more than anything. Thank you so much for sharing! Another great post, thank you! I appreciate the insight into the hockey culture driving home even more the depth of the gift given this young man. I read this today. Haven’t had time to read this weekend. But it was nice to read something good about sports after the sad event that happened today in Sweden. A fotball supporter of the same team I support was killed in a fight. He wasn’t even a hooligan, he just happened to be in the wrong place. It all ended with pitch invasion and riots and the match was cancelled. So it is good to end it with something that makes me happy. People caring for each other. The good side of sports. Thanks.